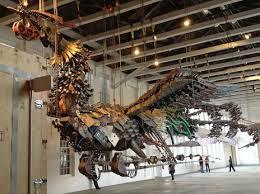 Chinese artist Xu Bing used what is referred to as “detritus” but many of us would label “trash” to create two giant Phoenix (yes, that’s the plural) that currently hang in New York’s St. John the Divine in Morningside Heights. Winging over the nave, Feng, the male, and Huang, the female, are gigantic, made under Xu’s supervision by migrant workers using demolition materials and worker’s tools found in Beijing. In Greek mythology, the phoenix is a long-lived bird that cyclically attains new life by rising from the ashes of its predecessor. Obviously, no one has any idea what the bird looked like. Feng and Huang were previously on exhibition at MASS MOCA in North Adams, MA, one of my favorite museums. Since they weigh a stunning twelve tons (one is 90; the other 100 feet long), transporting them to New York took eleven flatbed trucks. 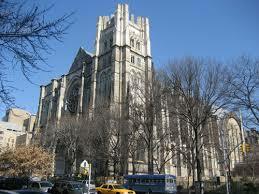 To get the birds inside, the Cathedral had to remove its massive front doors. You have to walk under and around them to take them in fully and pictures don’t do them justice. The day I visited, a bishop was being ordained so there were clergy from all parts of the world, many in bright-colored vestments, all delighted with their surroundings (and presumably the newly installed bishop.) 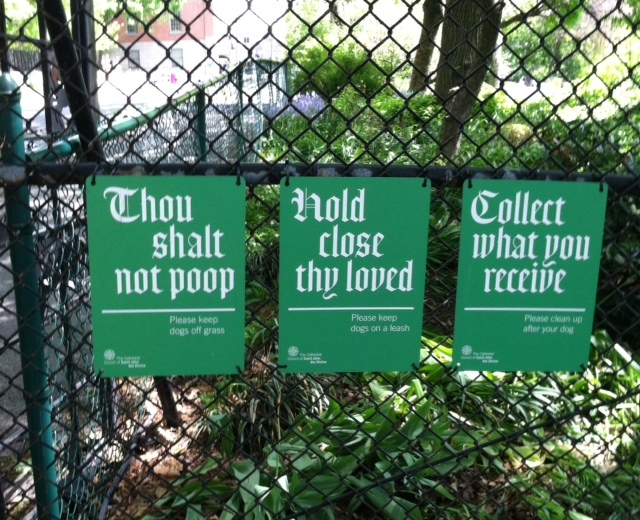 Before you visit the Cathedral, stop at the park right next to it to enjoy the sculpture designed with kids in mind but just as wonderful for adults and take a look at this great sign. If you aren’t counting calories, stop at the Hungarian Pastry Shop across the street and indulge in a class A sweet that you can take out or eat on the premises. Combine the shrimp marinade ingredients in a bowl. Add shrimp and stir to coat. Let stand for 10 minutes. Combine chicken marinade ingredients in another bowl. Add the shrimp and stir to coat. Let stand for 10 minutes. Place a stir-fry pan (any shallow pan) over medium-high heat until hot. Add oil, swirling to coat sides. Add garlic and ginger; cook, stirring, until fragrant, about 10 seconds. Add chicken; cook, until chicken is no longer pink, about 1 minute. Add shrimp and stir-fry until they turn pink, about 1 minute. Add bell peppers and snow peas and stir-fry until snow peas turn bright green, about 1 minute. Add the seasoning and bring to a boil. Add cornstarch solution and cook, stirring, until sauce boil and thickens. Serve. Or, buy something fabulous at Hungarian Pastry Shop. Much less work and cooler now that warm weather has arrived. This entry was posted in Uncategorized and tagged bird, chicken, Phoenix, strudel. Bookmark the permalink. a nightmare. 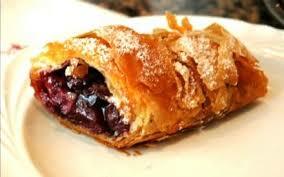 Pass that cherry strudel!